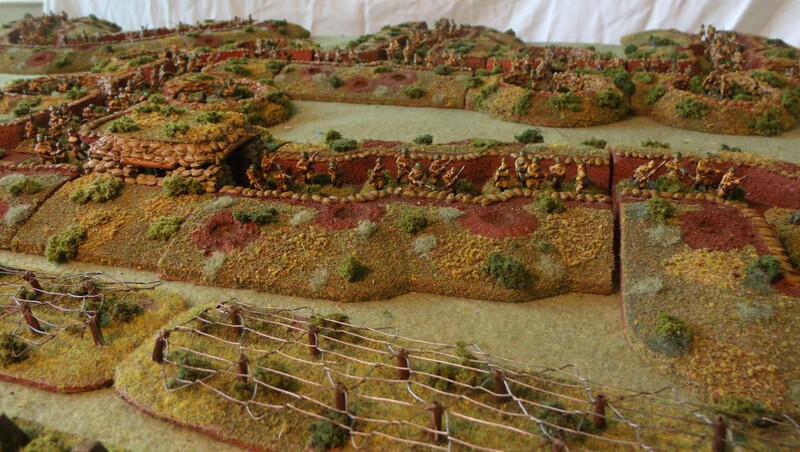 Adding bunkers and other improved fighting positions to your trenches can greatly improve the look of them! A plain trench is great for infantry, but you can’t really fit anything bigger into it. If you want your defensive positions to include anything larger, you will need to make specially prepared positions for them. Making gun positions and improved fighting positions is a fairly straightforward process. The same materials used to make trenches were used, just in greater amounts. The smaller guns are mounted on the same size of base as infantry, just with a different orientation. The gun positions were therefore made using the same dimensions as the trenches, just turned 90 deg so that the guns pointed in the proper direction. Sandbags were then stacked up along the sides of the position to reinforce it. Mortar and anti-aircraft positions are traditionally round since they are designed to be able to fire in all directions. For this reason we started with a round depression instead of the usual rectangular one used for the trenches. The sides were then lined with sandbags just like the other gun positions were. The machine gun bunkers with overhead cover were made by reinforcing the trench walls with sandbags and piling them up higher than the trench to form firing ports. The roof was left as a separate piece so that miniatures could be easily placed inside of them.